Basically, Adidas is a German multinational corporation founded in 1948. For over 80 years the Adidas Group has been a part of the sports world. Adidas works on the simple strategy of continuous strengthening of brand and products in order to improve competitive level and financial performance. A sportswear brand established years ago became an attraction of footwear that caters special needs of different athletes. Adidas- Style focusing on casual clothing. Originals- offering lifestyle and fashionable products. Performance- dealing with training and sportswear products. Besides this, it also deals with its own line of perfumes and fragrances, bags, T-shirts, watches, Eyewear, etc. The outlet of Adidas at Celebration Mall in Udaipur serves you with the best of its products.de Adidas plays an important role in catching the eye of the beholr especially the youth of the country. There are hundreds of channels of Adidas all across the country. All the products lie within your comfort zone. 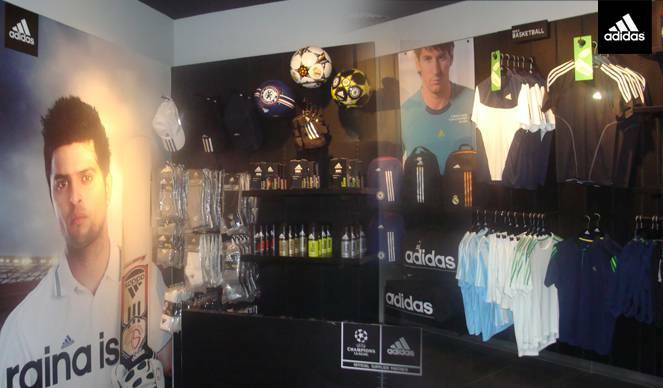 We are obliged to welcome you to a shop where you can easily deal with your sports statement. A bashing invitation for all those sports lovers out there.